Surgery is a scary thought for anyone, but advances in human medicine are helping to make patients more comfortable and shortening stays in the hospital. Even our pets are now benefiting from these improvements as cutting edge innovations are making their way into veterinary offices, providing a higher level of care for our pets. Laparoscopic surgery, a minimally invasive type of procedure, was first performed on a dog in 1902! In the intervening years, human surgeons have perfected techniques to removal gall bladders, relieve the discomfort of endometriosis, and even help individuals with morbid obesity. Many of these techniques have been adapted by veterinary surgeons as well. A laparoscope consists of a telescoping rod and lens system connected to a video camera and light source. The surgeon inserts the laparoscope into the patient through a tiny (less than 1 inch long) incision. The abdomen is then filled with carbon dioxide to create space to work. Additional attachments, such as scissors, retractors, and devices for placing sutures are introduced and manipulated to complete the surgery. The biggest benefit to laparoscopic surgery is the reduced need for a large incision in the abdomen. In the case of human gall bladder removal, traditional surgeries would create an incision about 8 inches long. With the latest laparoscope, 4 incisions, all less than ½ inch, will suffice to remove the gall bladder. Smaller incisions mean shorter recovery time, shorter hospital stays, and, above all, less pain. Veterinarians have seen these benefits and are anxious to export them to our pets. Laparoscopic surgery is becoming a viable alternative for pet owners wanting to provide a human-level of surgical care for their pets. 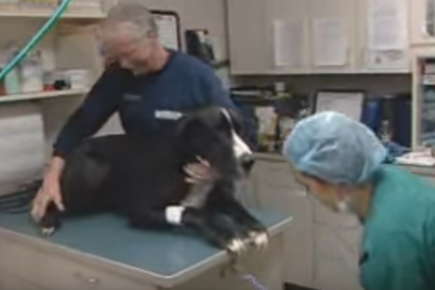 Surgeries that are considered "routine" by pet owners and veterinarians, such as spaying a female dog or cat, are now considered good candidates for the laparoscope. A surgical center in Colorado performed a small study in which 10 dogs were spayed via traditional surgical methods and 10 dogs were spayed with the laparoscope. The results of this study show that 90% of the traditionally spayed dogs needed additional pain relief medications after surgery whereas none of the dogs in the laparoscopic assisted group did. Blood concentrations of cortisol, a good indicator of stress levels, increased only in the traditional group. These findings, as well as her own observations, have led Dr. Kuschel, a veterinarian at Deer Creek Animal Hospital in Colorado and her associates to eliminate traditional spays at their hospital. She stated that, "The price was significantly higher for the laparoscopic assisted procedure, but we actually did the same number of spays from one year to the next. We increased our level of care and now pet owners actively seek out our services because they know and understand the benefits of this cutting edge technology." Veterinarians are not only using this revolutionary new tool for spays, but as an aid to help diagnose disease. Surgeons are able to biopsy internal organs with laparoscopic surgery and the procedure often requires no more than sedation and a local anesthetic. Previous protocols for biopsies demand general anesthetic and a prolonged recovery time. With some laparoscopic biopsies, the patient is often ready to go home in less than two hours! Although this technology is truly leading edge, don't expect it to show up in all veterinary offices immediately. Although this is all good news, laparoscopic surgery is not very common in most veterinary hospitals. If you are planning a surgery for your pet, ask your veterinarian about the potential for laparoscopic assisted surgery in your area. Laparoscopy is a type of minimally invasive surgery. These surgeries provide a higher level of comfort when compared to many traditional procedures. Laparoscopes use a telescoping rod and lenses that are attached to a camera and lights to view inside the body cavity. The biggest benefit to laparoscopic surgery is that surgeons can utilize much smaller incisions, meaning that your pet will experience less pain and discomfort. Veterinary surgeons report better visualization of the internal organs and reduced chances of hemorrhage when laparoscopes are used. Laparoscopic surgery is used for routine spay surgeries, internal organ biopsies and for helping to prevent "bloat" in large breed dogs. Small studies have shown that dogs spayed with a laparoscope experience less pain and need fewer pain medications after surgery.